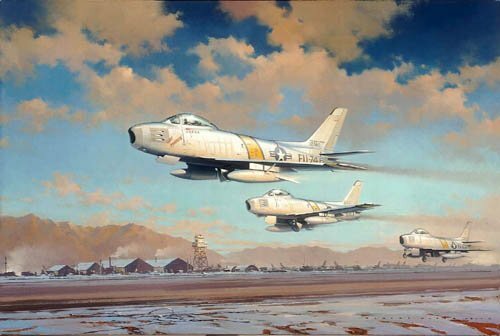 The frosty morning air is shattered by a ‘hunting party’ of F-86 Sabres of the U.S. 51st Fighter-Interceptor Wing, as they blast off the runway at Kimpo airfield, South Korea. Led by Gabby Gabreski, they are headed north to the Yalu River, and Mig Alley. Each print is signed by the award winning artist and FOUR get fighter Aces who flew and fought the F-86 Sabre in the Korean Air War.